← Don’t Touch Anything. Keep Going. One of my favorite seasons in the bookstore is summer when, not only are we graced with our regular customers but have a lovely abundance of tourists as well. Some are visiting relatives in the area, some find their way to us through travel websites, and some…well… A few years ago I was standing behind our counter and looked up to see a navy blue-suited tour guide waving a flag and speaking Italian in her no-nonsense follow-me voice. Behind her trailed a group of about ten tourists all looking about quickly as they were rushed through our store to the back garden. After a leisurely lunch they did meander back in to shop and converse. If I could name my preferred group of people, it would have to be the Italians. Warm, enthusiastic and friendly. I still maintain e-mail correspondence with one of the couples from that day and hope to visit their off-the-beaten-path town on the Adriatic Sea…someday. While I’m waiting and saving money to travel, I can indulge my fantasy (for very little money) with books that take me to far-away locales where one can become immersed for a while in an exotic time and place. 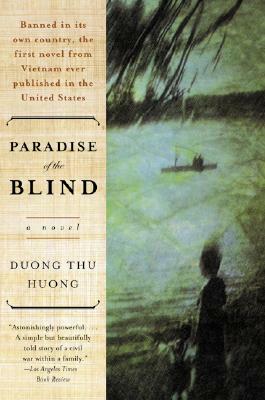 One such novel, Paradise of the Blind by Duong Thu Huong, is set in Vietnam right after the U.S. war there. It is the story of a mother and daughter and their struggle to survive in a society that burdens them with sacrifices that must be made to the family and the state. The author was herself in the communist army in the 70’s but left the party in 1989. She paints a vivid portrait of the day to day life, much of it devoted to the food, which is an important aspect of the culture, and one can almost feel the heat and smell the aromas. It is an excellently translated, haunting portrait with beautiful prose. On a lighter and funnier note, one can experience China in the summer of 1986 (about a week after they allowed tourism). 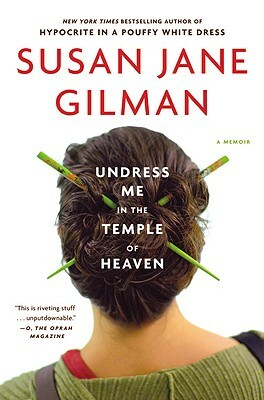 Undress Me in the Temp le of Heaven, a memoir by Susan Jane Gilman is both funny and riveting. Two college acquaintances decide upon graduation to spend the summer “going around the world” and begin their trip in China. Neither is an experienced traveler, neither has any understanding of China, neither has made plans — they just take off on a hilarious and terrifying journey. The beauty of this book is that we get a glimpse into the China of yesterday (even though it was only 25 years ago)… a China before the western capitalistic influence and just after the travel restrictions had been loosened (somewhat). If you naively thought (as I did) that it was all about communes, think again! 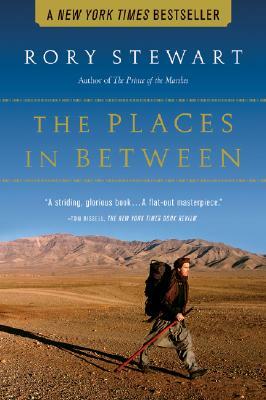 If you would like to understand Afghanistan, its diverse tribal cultures and terrain, then pick up a copy of The Places In Between by Rory Stewart, a Scottish journalist who decided to walk across the entire country, in the winter of 2001 right after the U.S. invasion to fight the Taliban. One can’t imagine what was going through his head… well, not until one reads the book. It is a gripping story of survival, not just under extreme weather and mountainous conditions, but the ever-looming threat of war lords and the Taliban keep our attention riveted. A travel adventure I would never want to go on, but thoroughly appreciate the author’s having done it and reported it in an objective, low-key narrative. Completely spellbinding. Since I’m not taking a “big” trip this summer, I have subscribed to many travel websites and blogs and indulge my wanderlust in my imagination… It’s rather like getting the latest toy catalog when you were a kid and sitting with it circling the items you wanted Santa to bring you. Thus, I sit in front of my computer taking imaginary trips, renting villas in Italy, sailing the rivers of Europe, and e-mailing my Couchsurfing friends in other countries. Donna: This is a completely unbiased comment . Your writing style is so warm and nourishing and universal. It can speak to any age, ethnic group or nationality, and I always want to read more. You should be writing a collection of essays, (whatever happened to essayists?) on any topic that crosses your mind! P.S. I love your analogy of a child marking a toy catalog for what he/she dreams of getting with your own fantasy travels.